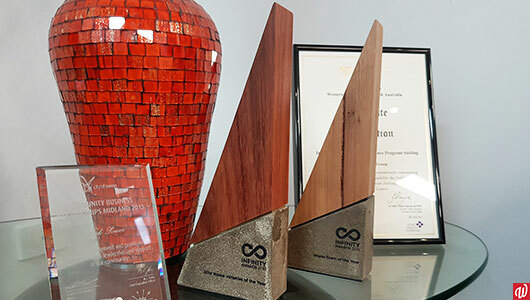 Home Social Enterprises Balcatta Recycling Balcatta wins dual awards at the Infinity Awards 2018! 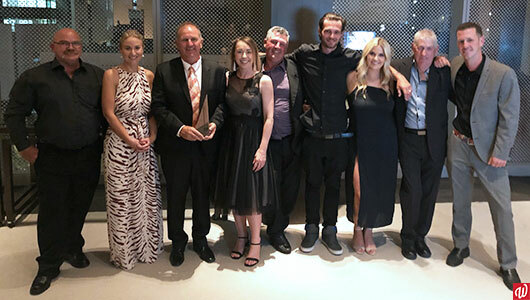 Balcatta wins dual awards at the Infinity Awards 2018! Pictured above, left to right: Shaun Cronin, Lee Broomhall, Bill Elliott, Mairead Connolly, Ted Vernede, Kyla Lauder, Lucy Elliott, Lyndsay James, and Andrew Rose. 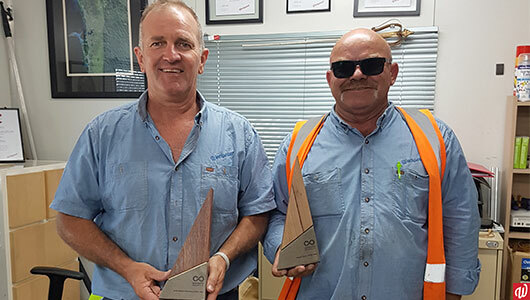 Did you hear that our Balcatta Recycling Shop (BRS) team took home not one but two Infinity Awards at last Thursday’s ceremony? Here’s the full details of the awards, gala night, and what it means for our hardworking team. Several months ago, we were nominated for the Infinity Awards 2018. We were lucky to receive the award last year as well, but this nomination was extra special as it recognised our amazing team at Balcatta! To celebrate, team members swapped their Hi-Vis vests for suits and cocktail dresses for a glamorous gala night at The Westin on Thursday 15th November. The Infinity Awards celebrate West Australians who’ve achieved incredible outcomes towards an environmentally sustainable future. The categories recognised innovative solutions to reduce waste and promote reuse and recycling across a wide number of areas. The Minister for Environment and Disability Services, Hon Stephen Dawson MLC, and Waste Authority WA members attended the event. They were joined by nominees from local councils, industry, not-for-profits, and community groups. Our team were overjoyed to take home both Waste Team of the Year and the overall 2018 Waste Initiative of the Year! They celebrated in style and lit up the dance floor. A huge, well-deserved congratulations to the team! We’re passionate about our recycling and divert 5,000 tons of waste from landfill every year. Our Balcatta team, led by Manager Bill and Assistant Manager Shaun pictured above, are always ready with a smile to help you navigate our recycling site. Each team member plays a part in helping you make the most out of our recycling facilities. We’re there to greet visitors, give directions, offer advice, and assist you to pack and unpack your vehicle. The shop is also a popular destination for the whole family, and sees over 16,000 visitors a month. Many are regulars who come by each week to find new bargains and talk to our team members. These awards mean a lot to the team, who should be proud of their hard work and dedication to the job and helping others. Well done everyone! You can read about our media and community involvement here. Keep in touch with us through our website and Facebook, or contact us on (08) 9445 6591.